Gunmen kidnapped the head of Iraq's Olympic committee and more than a dozen employees Saturday after storming a meeting of sports officials just days after the coach of Iraq's national wrestling team was killed. The gunmen, wearing camouflaged Iraqi police uniforms, used at least ten vehicles for the kidnapping, police officials said. They added that the gunmen entered the room where a meeting was taking place and asked everyone to stand facing the wall. The guards of the building were not taken, but the kidnappers blindfolded and handcuffed all people present in the room, police officials said. Mahmoud said Ahmed al-Hijiya, president of the committee, was taken around 1:30 p.m. along with other employees as they attended a conference in Karradah, a Shiite neighborhood in Baghdad. Others seized included the deputy head of the Olympic committee, Ammar Jabbar al-Saadi; the chairman of the Taekwondo Federation, Jamal Abdul-Karim; and the chief of the Boxing Federation, Union Bashar Mustafa. The director of sports medicine, Dr. Faleh Francis, was originally reported to be among those kidnapped, but state-run television later said he was not part of the group. It's unclear how many people were kidnapped in all, but several estimates all put the number of people taken around dozens. Security guards outside the meeting did not interfere because they thought the kidnappers were legitimate law enforcement, police said. Two guards were killed, one while trying to flee the building; the other was shot dead and dumped on a street in Karradah. A bomb struck a Sunni mosque in Baghdad after Friday prayers, killing 14 people and wounding five, while mortars barraged a Shiite mosque north of the capital. The bombing, which came despite a driving ban aimed at preventing such attacks, occurred about 2 p.m. as worshippers were leaving after religious services in northern Baghdad, police Lt. Mohammed Khayoun said, adding that the bomb was planted near the door of the mosque. President Jalal Talabani has called for establishment of a national front to prevent a sectarian civil war. Talabani's statement was issued late Friday to mark the 1958 coup that overthrew the Iraqi monarchy and led to years of turmoil until the Baath Party took control of the country in 1968. The party held power until it was removed by a U.S.-led invasion in 2003. "The country is facing dangers and heading toward sectarian strife," Talabani said. The kidnappings of Iraq's Olympic officials comes a day after Iraq's national wrestling team pulled out of a tournament in the United Arab Emirates when its coach was killed in Baghdad. The Sunni coach, Mohammed Karim Abid Sahib, was seized with one of his wrestlers as they left the sports center to buy some sweets in the northern neighborhood of Kazimiyah, where the team was preparing for the tournament. He was shot to death while trying to escape; the other wrestler got away, according to police and wrestling officials. Elsewhere in Baghdad on Saturday, clashes broke out between Iraqi soldiers and gunmen in several areas of the city, leaving at least three people dead and 11 others wounded, police said. Seven people were injured in a mortar attack near Haifa Street in downtown Baghdad, just blocks from the Green Zone which houses U.S. and British embassies and the Iraqi government. All were hospitalized, police 1st. Lt. Muhammad Khayoun said. Similar clashes also broke out blocks away in the capitol, injuring four and killing two civilians. 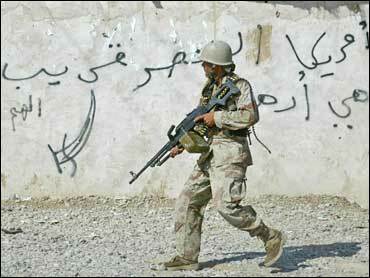 U.S. troops rushed to seal the area after the attacks, said Iraqi Army Maj. Salman Abdul-Wahid. The area along Haifa Street has seen heavy violence in recent weeks, which prompted Iraqi leaders to declare a state of emergency in Baghdad after erratic violence erupted there nearly a month ago. Also Saturday, Iraq's parliament voted to extend the state of emergency for 30 days, a measure that has been in place for almost two years. The violence comes as the conflict between Israel and Lebanon escalates, which has been condemned by Iraqi leaders who are fearful ramifications could be felt throughout the region. Thousands of Iraqis also demonstrated in the Shiite district of Sadr City in Baghdad and the southeastern cities of Kut and Amarah, praising the leaders of Hezbollah and denouncing Israel and the United States.